I enjoy watching NBA games. Not to fond of any other sports though. I also like to design logos and jerseys for NBA teams. So he made an account just to make that one post? I know I was completely and utterly dead wrong. I'm going to own up to that because I don't think I got a single thing right. No excuses really, guess I'll try better next season to get it right. My bad on the jersey choice for Paul George. Thought I'd pick those because they were new but I'll fix that mistake on the second draft. As for the Lillard over Westbrook, in the past few games Lillard's performance has outshined that of Westbrook. But when you take all stats for the season so far into account, Westbrook is has the edge. His numbers in assists, rebounds, and steals are all much higher while Lillard has a slim lead in points per game. Of course Lillard is playing great basketball and is willing a Portland team into a playoff spot when they were expected to be a lottery team. So it's a very close battle between him and Westbrook. There is a large battle among the guards after Curry. But upon second thought, Third Team might be too low for him. He may just take Lowry's spot on the Second Team. Thank you for the feedback. I appreciate it. And yes, the Warriors do play Green at center and when they run him there, they're very effective. However, when they do these lists, it is my belief they need an official center.. DeMarcus Cousins plays almost exclusively at the center position and has been the best center in the league so far while Draymond Green spends most of his time at the power forward position. So I would keep Cousins in the first team at the center position mostly for the fact that he is an official center. However, Draymond Green has been playing like an First Team player. Leading the league in assists per game for a forward and being in the top ten for assists per game in the entire league. Also to be leading the league in triple doubles. Those are some stats to marvel at. Unfortunately, being primarily a forward, he's not played well enough to dethrone Kevin Durant and LeBron James at the forward spots on the First Team. However, there is still time left in the season. Anything can happen. You brought up some great points. Thank you. I appreciate it. I'd like to encourage more people to offer feedback. Do you agree with the lists though? Sorry for the long wait without an update. I've made some slight changes to the primary logo in that the shadow is now gold and that the curved lines are now much more neat. The jerseys have been changed as well for my original designs were a little bit too dated for today's NBA. The new jerseys now feature a side detail that is somewhat similar to the Rockets' current alternate jersey. I've also added a new number font to the design. Also by request of one of the users, I've created a new secondary logo design. Here are the new designs. Primary Logo: Secondary Logo: Home Jersey: Road Jersey: Alternate Jersey: C & C appreciated! Back with some updates. I've come up with two variations of the original because I received two different opinions. The first variation is the original minus the Pistons and the second is a variation where the basketball has been removed. 1st Variation: 2nd Variation: About the uniforms, the changes I made were very slight since the Pistons do have a very classic look and I didn't want to make any drastic changes. The biggest changes are in the collars which now feature a red/white/blue color scheme which is a feature that made an appearance on their uniforms during the eighties and also the waist area features the same change. Those are really the only changes to the uniforms. C & C appreciated. For now, the rule is the same in that a division leading team is guaranteed a spot in the top four however Adam Silver has been pushing hard for a change in the rule. So, since the rule has not yet changed here is an updated season and playoff predictions. I'm sorry if my previous statement came off as offensive, I did not mean for it to come off that way. A lot of what I said was based on facts. However, I understand that I was bias in the earlier posts and I apologize. My earlier post was not meant to be a strike against anyone though. I will try to maintain neutrality among all teams throughout the rest of the thread. I hope that there aren't any hard feelings. That is the real NBA playoff logo, they were supposed to have them appear on the courts during playoff games this past postseason but for some reason they were not used. The Warriors are going to have a hard time in the postseason as well as the rest of the elite teams in the West. Albeit they are one of the four best teams in the West, but again there is no clear cut advantage in the Western Conference because any team that comes out of it will have had to face either a healthy OKC, a San Antonio team that is as strong as they have been in a while, the Warriors who did have a great season last year, or a Clippers team that is much better than last years' team. To me, the two teams that will meet in the WCF will be the Spurs and the Clippers and there is really no telling how it will turn out. The Spurs likely have an advantage because they have more experience in the postseason than the Clippers so I may be wrong on the previous prediction. I believe that Adam Silver is planning to implement it so that playoff seeding is done strictly by record because of what happened with Portland last season. Here is a slightly updated Playoff chart. The Clippers blew a GOOD chance at making the NBA Finals last season, but I wouldn't say it was their best chance. They have fixed every problem that they had last year with the drop off on talent at small forward and on the bench. I may be a little bit bias since I am a Clippers fan, but you cannot look at their team and not see a team worthy of a Finals appearance. I think that the Spurs have an equally good chance of making the Finals, they some of the best moves in the off season and are definitely going to give the NBA a run for its money. However, when you add in a piece that completely changes the lineup of your team and you are being forced to run Tim Duncan at center without much talent to back him up. It is a high risk, high reward situation. They lost a lot of their depth this off season. I wouldn't be surprised if I saw the Spurs in the Finals, they are among the top 3 teams going into the next season. 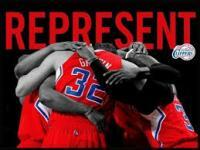 I just feel that the Clippers proved that they can beat the Spurs with last year's playoff victory. The Warriors will most likely not make the Finals this year. Last year was as lucky a run as their ever has been in the history of the NBA. Besides, the rest of the Western Conference got better while they did nothing to improve their team. If anything the departures of David Lee, a great backup PF, and Alvin Gentry, one of the league's supreme offensive coaches would serve to show that they have gotten worse this off season. Thank you for your comments and I hope that I have addressed every point that you brought to my attention.